I will be teaching a set sequence known as the Yoga Synergy Fundamentals sequence formulated by Simon Borg-Olivier and Bianca Machliss of Yoga Synergy in Sydney Australia. It is a very carefully constructed sequence that is suitable for almost anyone and everyone, as there are variations of each posture. The main focus of the Synergy method is to move responsively and responsibly, so as to allow energy and information to move freely around and within the body. Yoga Synergy is a comprehensive system for practicing and teaching traditional yoga for the modern body. The practice of yoga brings awareness to the self and awakens the heart and soul of the individual. The more we practice yoga, the more we awaken and are able to guide others in this process of realizing our incredible human vitality. Practice is the key, and at Yoga Synergy we use methods to make the practice safe, responsive, dynamic, meditative and fun so that it is becomes a lifetime practice, enhancing and bringing joy to all aspects of life. Simon Borg-Olivier and Bianca Machliss, both advanced yoga practitioners, experienced teachers and physiotherapists, have spent 30 years developing a scientifically based method for practicing and teaching traditional yoga, called the ‘Yoga Synergy System’. This system offers a yoga practice that is accessible to all, easy to understand and to teach. At the same time it is a challenging practice that develops strength, flexibility, fitness, internal health and a meditative flow. After more than a decade of learning directly from yoga masters such as Sri Iyengar, Sri K. Pattabhi Jois and Sri Desikarchar in the 1980’s and 1990’s, Simon and Bianca returned to Sydney University to complete degrees in Physiotherapy (Physical Therapy) in 1993, to learn more about the human body for the benefit of their yoga practice and teaching. Their deep understanding of anatomy and physiology of yoga is applied in the Yoga Synergy method. This practical method aims to prevent and assist in recovery of, the many musculoskeletal injuries and medical conditions that occur as a result of modern yoga and exercise practice. The Yoga Synergy system is a technique/philosophy of practice that can be applied to any style of yoga. All yoga practice should be done with the intention to energize the body while calming the mind. By embarking on the path of yoga, one enters a journey to open the heart and clear the mind, to discover our true being, which is the ultimate reality – the transcendental self, the atma or the divine. We are essentially the same humanity as 5000 years ago, so the insights that were discovered then, in the name of yoga are still valid today. Yoga as the union of body mind and spirit leads one to freedom, compassion and harmony. Our aim at Yoga Synergy is to teach the ancient art of yoga in a safe, fun and intelligent way. We teach students to practice responsively (not automatically) so that each practice fulfils the physical, mental, emotional and spiritual needs of the individual practitioner, enhancing life force, energy and vitality. At Yoga Synergy, you will learn yoga that’s based on a deep understanding of anatomy and physiology, modern medical science and traditional Hatha yoga. The style of Hatha yoga taught at Yoga Synergy is derived from the work of Professor T. Krishnamacharya. Sri Krishnamacharya was teacher to three of the most influential yoga masters alive today – Sri Iyengar (author of Light on Yoga); Sri K. Pattabhi Jois (who developed Ashtanga Vinyasa Yoga) and, Sri Desikachar (author of The Heart of Yoga). Our unique style has been developed over 30 years by experienced yoga practitioners and physiotherapists Simon Borg-Olivier and Bianca Machliss. It incorporates asanas (poses and postures), vinyasa (exercises) and pranayama (breathing control) and meditation. It’s a dynamic, moving meditation, which links specific yoga postures performed in sequence, with specific breathing patterns. Our style of yoga is very effective in developing strength, flexibility, cardiovascular fitness, increasing energy and the ability to deal with stress. All postures have a simple and a more challenging version so – whether you’re a beginner or an advanced student, and depending on how you feel on the day – you’ll be able to choose the level of difficulty that suits you. 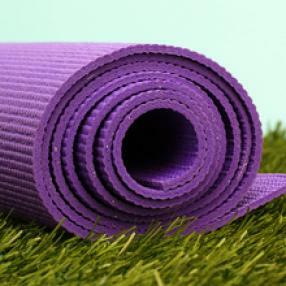 Gentle, alignment focused yoga class - learn, gain flexibility, develop strength and grow with us!